Open Arms: Bruno’s Story from Open Arms Worldwide on Vimeo. BRUNO’S STORY: Bruno Fernando Gomes grew up in a rough neighborhood in Assis, Brazil. A tough street kid from a broken home, Bruno became addicted to drugs at an early age, dropped out of school and was recruited as a dealer by a local gang. His friend, and Open Arms’ agent of hope, Eduardo Ribeiro understood the cycle of addiction, abuse, violence and incarceration Bruno was trapped in. Through Open Arms, Eduardo had given his life to Christ and escaped that same deadly cycle. Although he continued to share the gospel of Jesus Christ with Bruno, there was little fruit until Bruno’s life took an even darker turn. At the age of fifteen, Bruno was beaten and left for dead after using all the drugs he was supposed to sell. It was a pivotal moment. “As they were beating me,” Bruno recalls, “the only thing I could think of was Jesus.” The last thing he remembers before blacking out was crying out to Jesus for help. Four days later, a farmer found his body, which had been dumped in a field. Bruno regained consciousness days later in a hospital. It was then that his road to recovery began with a local pastor who took him to a rehab center. There, Bruno gave his life to Jesus and began growing in his faith. “Getting to know Jesus, coming to understand the Bible, I understood that He had something for me. I understood that Jesus wanted to give me life …He wanted to transform my life,” he recounts. It was then that he began to volunteer with Open Arms at the invitation of his friend Eduardo. INVOLVEMENT WITH OPEN ARMS: Bruno continued volunteering with Open Arms for five years while going back to school, eventually finishing his high school education and beginning his undergraduate degree in Physical Education. He will graduate college this December and plans to begin online seminary work soon after. Bruno joined OAW as a full time “Agent of Hope” in February of 2017. Because of the hope he found in Jesus, and because he knows firsthand what is at stake, Bruno’s heart is to reach at-risk children with the same transformative hope that he found in the gospel. While the struggles of Bruno’s youth and upbringing are tragically common in Brazil, they serve to highlight the glorious impact the gospel of Jesus can have in the life of “the least of these.” In many ways, Bruno’s life represents exactly what OAW seeks to accomplish by winning the hearts of marginalized children to Christ. When the cycle of pain, sin and hopelessness is broken by the redemptive power of Jesus Christ, those individuals are then able re-enter their communities as agents of hope, transforming them from the inside out, one life at a time. 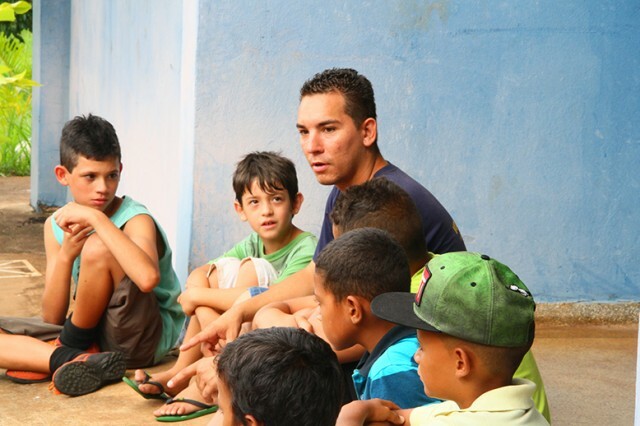 BRUNO’S MINISTRY: Today, Bruno ministers full-time in Cohab IV, a marginalized neighborhood in Assis, Brazil. There, he works with at-risk children and youth, most of whom are physically and emotionally abused by families who are heavily involved in drugs and crime. His work includes overseeing neighborhood programs where children are loved and cared for as they learn about the love of Jesus through biblical principles they can apply in their homes and communities. Bruno’s ministry there also involves home/family visits, sports programs, food distribution and biblical counseling while forming partnerships with healthy local churches. Additionally, Bruno heads up Project Zadok, an outreach at a youth correctional facility which was started as a ministry of Open Arms in 2011. His ministry there engages incarcerated youth through mentoring and Bible study with the goal of reintegrating them as agents of hope in their communities once they are freed. Many incarcerated youth have already given their lives to Jesus through this project. Bruno’s current support need is for $1,000 per month. Click HERE to support his mission today.